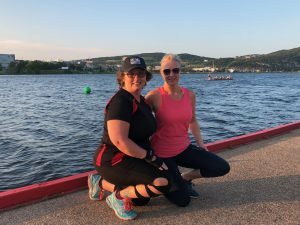 For me, the Royal St. John’s Regatta has always been a family affair. It first dates back to 1910 when my Great Grandfather, David Hallett, won Gold in the men’s S.U.F Society Race. That picture hangs on the wall in my parents residence located across from the Boat House on Quidi Vidi Lake. Growing up in that home meant we were always involved on Race Day, from being a small child helping out with our family canteen, to eventually getting into the shells and learning the techniques necessary to row. Exactly 100 years later in 2010, both my sister Dana & myself won Gold in the Female Service race, with our father David being our team’s Coach/Coxswain. Rowing is a great way for me to exercise and stay in shape, it will forever be a passion of mine! From the breath-taking morning spins on the pond & the lifelong friendships that I’ve gained… I will always come back to the races!